Stellar Planet: It’s about time! With the increased volume of exoplanets being discovered we are able to put our own solar system into context with observations that still baffle even the most seasoned astronomers. But what do we really know about these worlds and there always be more to learn? Since the first exoplanet was discovered orbiting the main sequence star, 51 Pegasi, in 1995 via radial velocity measurements a whole host of stars have been found to have their own orbiting planets. A number of different methods of discovery have radically expanded the field of exoplanetary science. There are now over 600 known exoplanets and over 1000 more potential planetary host candidates from the KEPLER list. By the end of this decade the number will almost certainly be in the 2000 region. Thus far exoplanet discoveries have been concentrated around large planets in tight orbits around bright stars. This is because they are the easiest to detect via radial velocity measurements or observed in transits, the two most lucrative techniques so far. The beauty of the transit method is that when the planet passes in front of its star we are also able to detect the atmosphere of the planet, and most are expected to possess an atmosphere. This method of observing exoplanetary atmospheres is called transmission spectroscopy and can tell us of different atmospheric species, their extent, and concentration throughout the planet’s atmosphere. Planets that have been found in transiting systems also produce an effect called the secondary eclipse. The secondary eclipse is when the planet passes behind the star, this will most likely have the same duration as the transit of the planet in front of the star. During the secondary eclipse, when the planet is completely behind the star, the amount of light measured is only coming from the star. When the planet is out of the secondary eclipse, just before and after disappearing behind the star, the amount of light measure is a combination of the star light, reflected light from the planet and thermal emissions from the planet itself. By measuring this change it is possible to calculate the temperature of the planet on the illuminated dayside, to determine transport in the atmosphere, and even cloud structures. These two methods; transmission spectroscopy and secondary eclipse, allow for further classification of exoplanets. 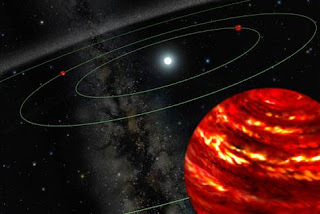 Though these methods have been exploited on only a handful of known exoplanets thus far, future measurements and observations will bring understanding and context to our currently unique solar system.